Youtube Channel : TheRecyclers TM || Subscribe!! Follow for more photos and Videos! Wheel Package: Racing Dynamics rd2 19"
Enjoy the unique build! Subscribe/ Share! Last edited by TheRecyclers; 11-10-2018 at 02:43 AM. Follower for more photos and Videos! Very very nice but it's 1 of atlese 5, Here's a couple pics. Only one with full "DINAN" build.. Has over 12 DINAN points, haven't seen any E31 S62 swap with that. I call her "The One" and thank you I appreciate it. I have the badge, just didn't install yet, I just believe the vehicle speaks for itself. Very nice work. The car looks great, can you comment on the driving experience? Thank you, put a lot of love into this build. The driving experience is every bit of what I thought it would be. I've owned an E39 M5 and I simply love the power it comes with, and my favorite all time car is an 8 so I wanted 2 in 1 package. Every time I drive this car I get an adrenaline rush cause of the high rear end throws it from side to side. Its a pure raw experience, its surely not a cruiser anymore, the way we got the car buttoned up changed the whole ride. Very responsive, going from the handling to every gear I throw it in. Truly something I visioned before starting this project, I driven a CSI, and all kind of 8's, but none compares to the power this one expresses. Congratulations on a successful build. What was the hardest part of the conversion? How did you get the body computer to connect to the engine computer? Well said the hardest part of the build was wiring and making sure i can drive this car around daily, meaning all functions work, a/c blows, and car runnning perfectly without any error codes. 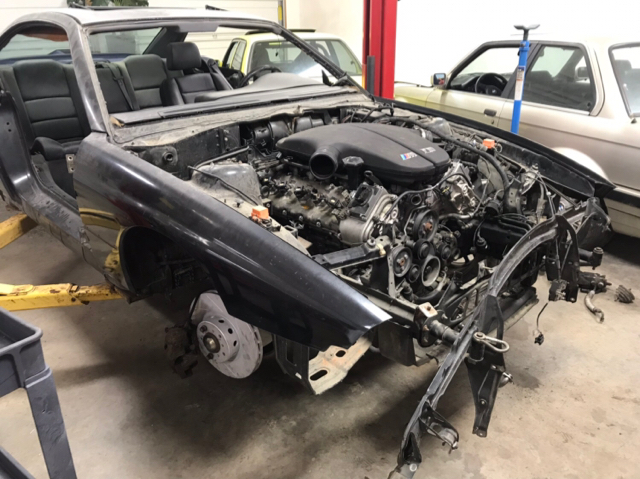 We did direct wire harness from the s62 engine wiring to the 8 series engine harness and left the body harness alone becuase we did not do any dash board or speedometer changes as we left all of that stock to the factory e31. If needed done for anyone on the board i am a member that will help with anyone wanting to the the same swap as i know it is desired by many members to get more power out of their e31. Awesome build!!! The question is... How much would it cost for you to help fellow E31 members to build one like this?! I will be selling a complete write up of the entire build! Every part needed to finish the build step by step for 1500$! Also if helped needed for a harness i can also build the harness for members as well for a price! Let me know if interested to anyone who is wanting to do the swap! J would love to see many more e31 s62 builds on the road!!! Oh that’s it?! HAHA good luck selling one! Its not to much for what the car will become. Also i have already sold two write ups for e31 owners. What i send is literally step by step instructions to start and finish the build. It is not a simple plug and play swap to do and the worth if the vehicle jumps up in price. Believe me if it was an easy task im sure we would see a lot more e31 s62 builds. 2 sold already ! Thx for the luck either way. The price spent on a easy step by step instruction for a build like this is nothing compared to what the car will become and the price increase of the vehicles worth. Also believe me if it were an easy task im sure we would see a lot more members with an e31 s62 build. My write up will help a lot of people who have been thinking about this swap. It will make their job a lot more easier and way faster then someone will think. Bonus is i can have a plug and play harness built as well for any member interested ! The rarity of our e31s are only matched by the generosity, selfless sense of community, and willingness to give freely to others, by the members of this unique forum, quite unlike any other. Exactly! Go to eBay if you are selling knowledge bc that is 100% against the spirit of this forum. An important question - where does the seat belt harness attach to on the top - hopefully not the floor, but rather the rear shelf somewhere close to the speakers. Last edited by rogbmw; 11-10-2018 at 11:38 AM. i have a roll cage being made at the moment and will be a top mounted seat belt inspired by the bmw m8 (e31). yea np man ! check on their wbsite dinancars.com and check out the entire point system. Looking good!! Here’s my m5 engine swap on my e31!